The Royal Swedish Academy decided to award the Sveriges Riksbank Prize in Economic Sciences to William D. Nordhaus and Paul M. Romer, for integrating innovation and climate with economic growth. Dr. Nordhaus was the first person to create an integrated assessment model, i.e. a quantitative model that describes the global interplay between the economy and the climate. Dr. Romer laid the foundation of what is now called endogenous growth theory. The theory is both conceptual and practical, as it explains how ideas are different to other goods and require specific conditions to thrive in a market. India and Russia, have formally inked the $ 5.2 billion deal for S-400 system. The air defence system is expected to be delivered by the year 2020. The Russian S-400 Triumf advanced air defence system became a bone of contention between India and the US, particularly after the US brought in a new law on August 2, 2017, called ''Countering America’s Adversaries Through Sanctions Act' or CAATSA. This, among other things, imposed new sanctions on Iran, Russia and North Korea. The S-400 Triumf is an advanced surface-to-air missile system, developed by Russia’s state-owned company Almaz-Antey, and can shoot down hostile aircraft and ballistic missiles. It has an estimated range of 250 kilometres and a possible upgrade is speculated to extend it to 400 kilometres. The JMSDF Ships would be participating in the third edition of Japan-India Maritime Exercise (JIMEX) with the ships of Eastern Fleet of the Indian Navy (IN) from 07 to 15 October 18. In the September 2018 RBI survey, 35.2% said their employment prospects had improved, while 45.5% said they had worsened. The net response is a negative 10.3 percentage points, far worse than in December 2013. 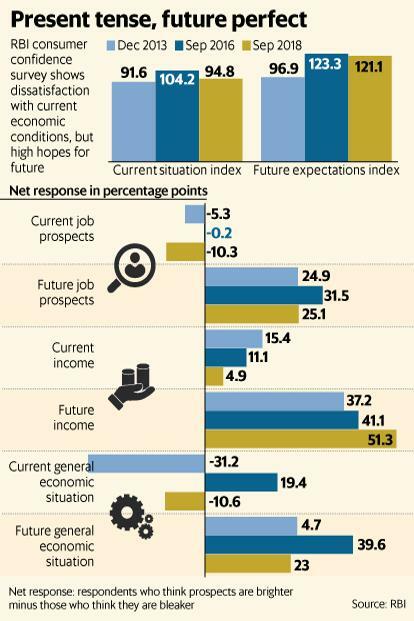 The one-year-ahead-expectations survey shows that 54.1% say job prospects will improve, while 29% believe they will worsen. That’s a net positive response of 25.1 percentage points. 28.3% said their incomes had risen, while 23.4% said they had decreased. The net response is a mere 4.9 percentage points. Expectations for the year ahead - The net response in September 2018, at 51.3 percentage points, is higher than the net response of 37.2 percentage points in 2013. People remain hopeful that incomes will rise. Sharma is appointed for six months or until further orders and will have the task of ensuring a smooth transfer of majority ownership from the government to Life Insurance Corporation of India (LIC). Sharma is a former MD and CEO of Canara Bank. A 10-member panel set up by the corporate affairs ministry will examine the trends in digital economy, including steep discounts in online retailing, and whether the e-tailers are subject to any restrictions in their access to dealerships from manufacturers. The Reserve Bank of India (RBI) has asked for a commitment of staying invested a minimum three years in local debt from them. In exchange, it has offered unbridled access to local derivatives market and its own liquidity facilities. Foreign investors can hedge their investments for both currency and interest rate risk the way they want. And they have to commit 67% of their investment, whittling down their commitment by a maximum of 33%, giving them flexibility to manage their gains or losses. The Chief Minister’s Sashakt Kisan Yojana will subsume three state flagship programmes, namely - CM’s Employment Generation Scheme, CM’s Agri-Mechanization Programme and CM’s Flagship Programme on Tea and Rubber. The Chief Minister’s Krishi Samuh Yojana aims at empowering the farmers through cooperative approach, by providing timely supports and marketing interventions of the government for better price realization and doubling farmers’ income. The children of construction workers would get financial assistance for their education in Industrial Training Institutes (ITIs) and polytechnics. While an ITI student will be entitled to get financial assistance of Rs. 23,600, a diploma student to get Rs. 26,300 per annum. A total of 1,878 students will get benefit from the programme. Yashasvi Jaiswal was adjudged man-of-the-tournament for scoring 318 runs in the tournament. The tournament held in Bangladesh.